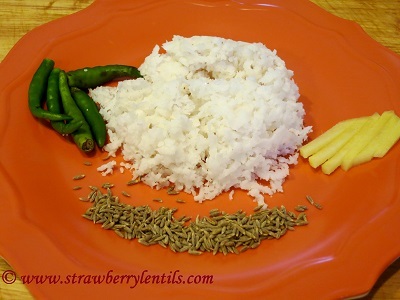 I am beginning this post with an apology to Sugarfree Sweetheart Priya , because this recipe was intended to be part of the diabetic friendly food week she hosted, but did not make it in time :(. It was one of those weeks, where everything seemed calm and quiet until things started rolling and before you knew, it was an avalanche and you are buried deep under trying to catch a breath. It was frustrating to have all the photos in the camera, yet not able to find an hour to sort through them and post the recipe online. However, it was a happy avalanche , had my college buddy over for thanksgiving, and met two other college mates over the weekend and it was an unplanned and unintended mini college reunion, which is always fun. 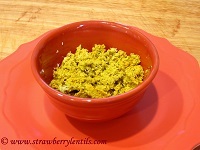 Even though I didn’t post in time, the recipe is still a very diabetic friendly food and I just love it for its taste. I also have a weird personal connection with this “Adai”. 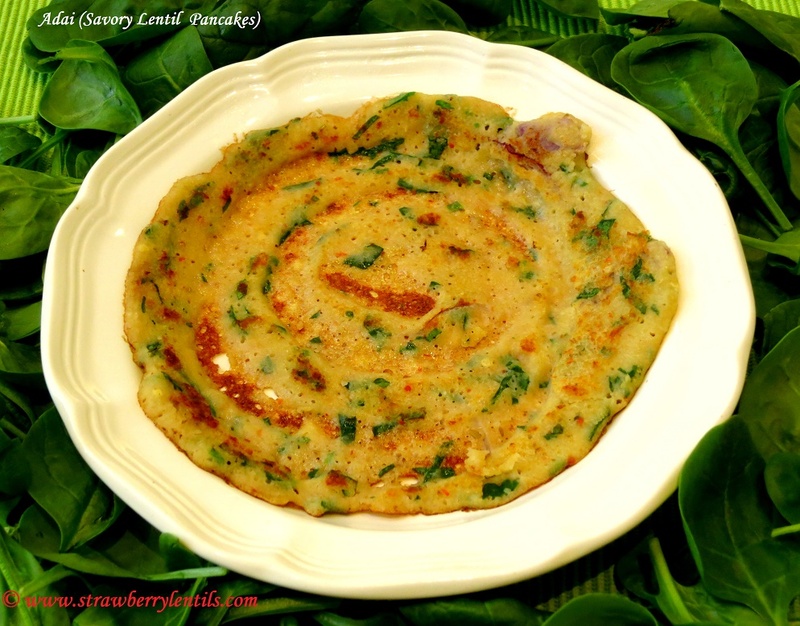 In May 2002, suddenly I started craving Adai, so I kept making them two or three times a week, and two weeks later I found out that I was pregnant with my first child. And in July 2005, when I started super-craving Adai again, I just ran to the store and got an early pregnancy kit and guess what , I was pregnant with my second child. Pregnancies and the cravings…….. 🙂 No more crazy cravings…… and thank God for that ! 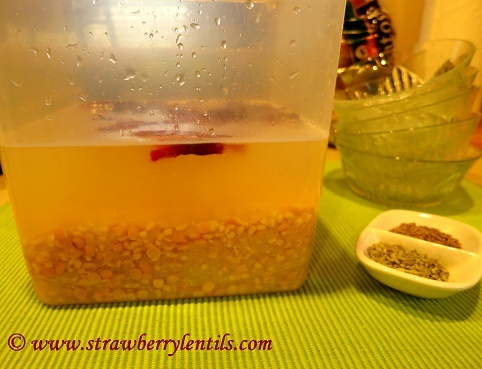 Soak the rice and lentils in water for 3 hours. 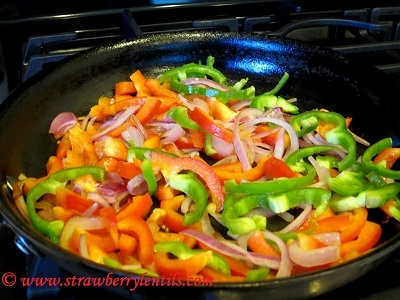 I also soak the red chilles with them as it helps them to grind better. 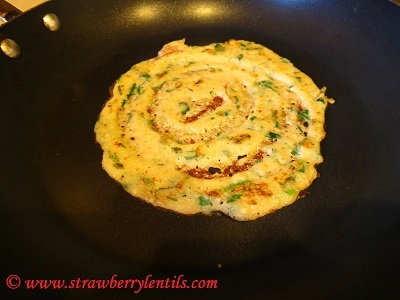 After 3 hours, grind the soaked rice and lentils with red chillies, cumin, fennel and salt to make a coarse batter. I grind in my blender and it takes only two minutes. You can make pancakes with just plain batter. 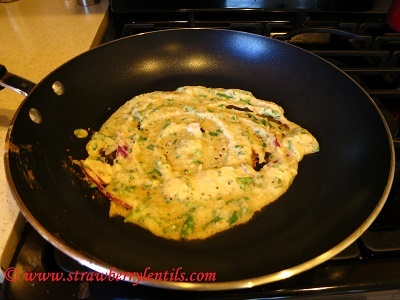 But adding onions and greens add more texture and taste to the adais. Traditionally, drumstick leaves are used. 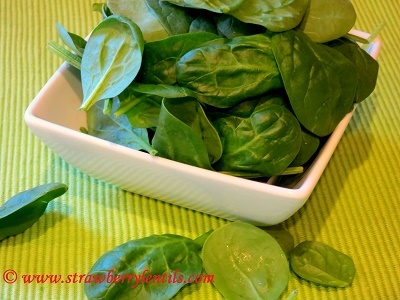 They are not available here, so I use spinach. 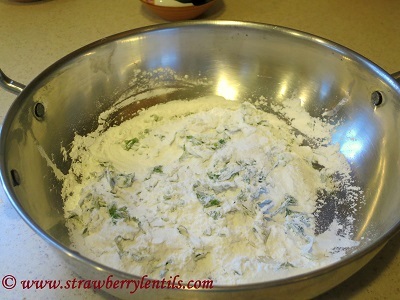 Thinly slice an onion and chop baby spinach and add to the the batter. Heat a skillet and grease with cooking spray. 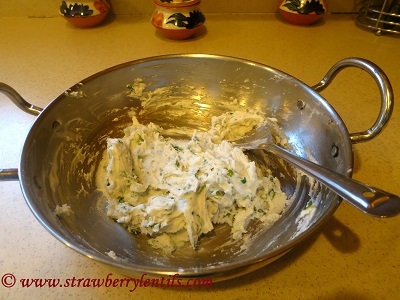 Pour a spoonful of batter and spread evenly. 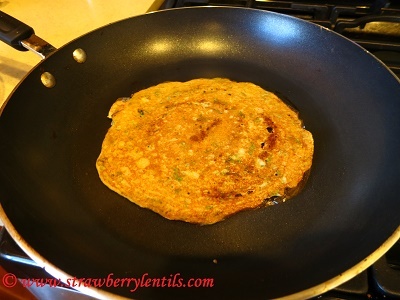 When you see the adai browning slightly, flip over and cook the other side. 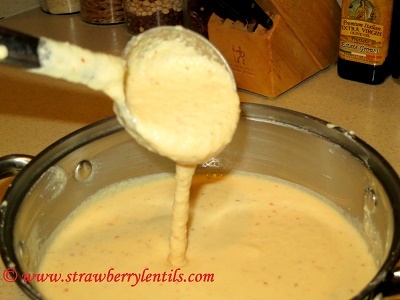 Flip one more time and cook until you see brown spots. The lentil batter takes longer to cook. 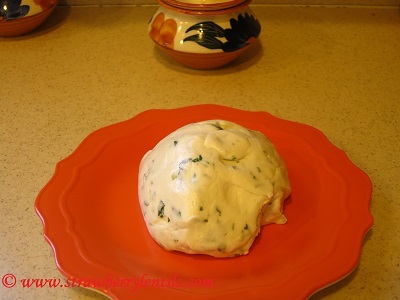 Adais can be served with coconut chutney or a dollop of yogurt. If you ask me, they are good on their own :). This is a Kerala recipe, Malabar to be precise. Pathiri is a pancake(steamed) made with roasted rice flour. “Adukku” means layers. 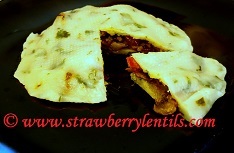 The rice pancakes are layered with some filling (usually meat or sweet) in between them. 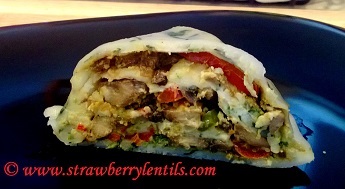 I made a veggie filling with my favorite vegetables and the typical kerala coconut seasoning. May seem like a lot of steps, but quite simple to make. 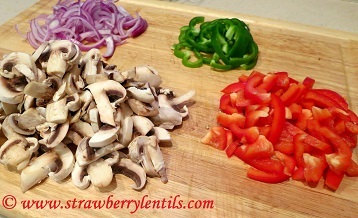 (These are the veggies I am using (my favorite pizza toppings 😉 ). You can use any vegetables of your choice. Cut the vegetables thin. 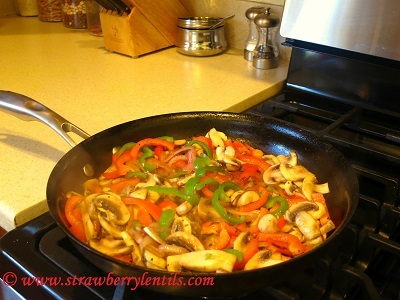 Heat a tsp f oil in a skillet and saute the onions and peppers. Add the mushrooms. Add salt and pepper. Grind the above ingredients without adding water. Grind them just enough that everything blends, no need to make a fine paste. 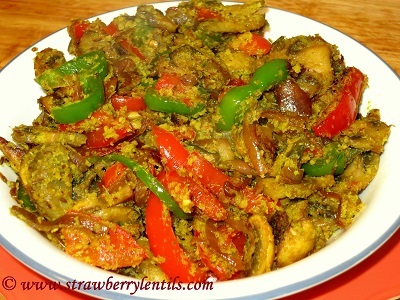 This is the standard seasoning used in Kerala for the vegetable stir-fry (thoran). It is simple but fresh. 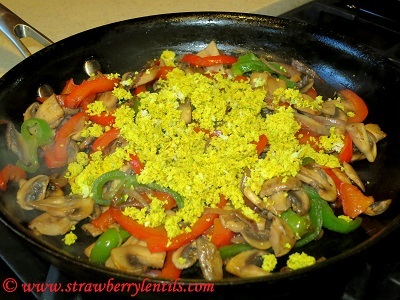 Add the seasoning to the sauteed vegetables and cook for a minute. This concludes the making of the filling. This, in itself, is a good vegetarian side. 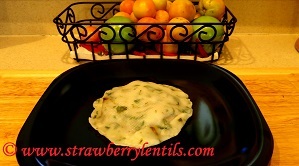 Now to make the pathiris (pancakes), you will need the roasted rice flour. This should be available in Indian grocery stores in some version. 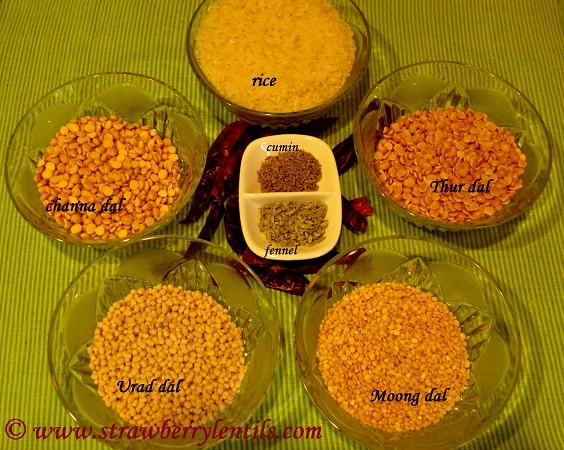 Pathiri powder, Idiappam powder, Appam powder, puttu powder…..any of these can be used. If you can’t find it, just regular rice flour will work too, though there will be a slight difference in the softness of the pancakes. 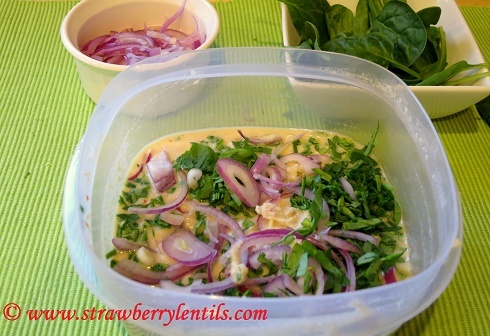 To a cup of roasted rice flour, add salt, a tsp of oil and some chopped cilantro. 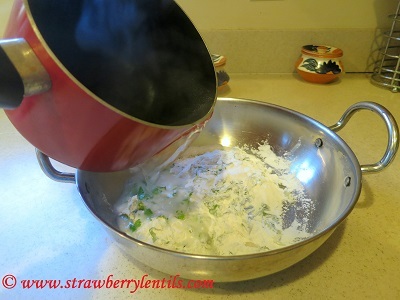 Boil water in a sauce pan, and pour the boiling water to the flour. 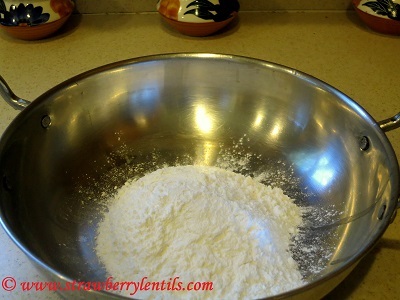 Pour enough water to wet all the flour and mix with a spoon (as it will be too hot to touch). After a couple of minutes, when your hands can bear the heat, knead it to a smooth dough. Rubbing oil in your palms makes it easier. Okay….now for the fun part 🙂 Traditionally this is done using banana leaves. If you are not lucky enough to get one in your place (like me), here is an easier alternative I learned from a friend. (Trust me, this is much easier than using aluminium foil or plastic sheet). 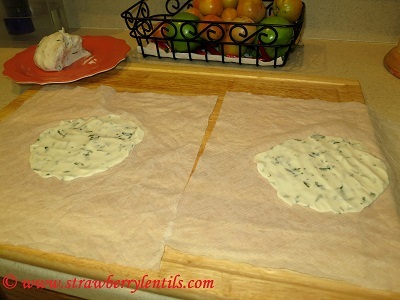 Wet a paper towel (bounty or brawny, something that won’t collapse when wet). 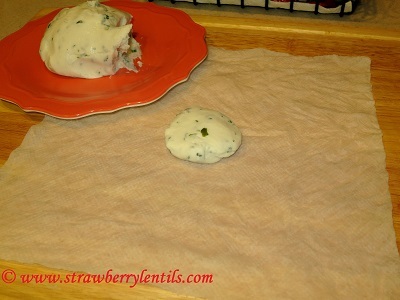 Place a small ball of dough on the wet paper towel and spread it with your fingers. Make two pathiris. 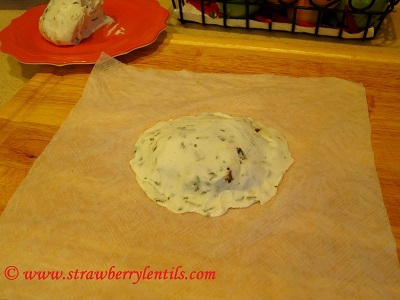 Place the filling on one of the pancakes. Now place the other pancake over the filling. 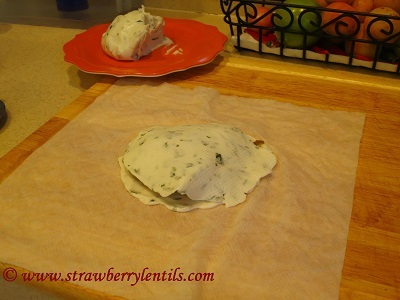 This can be easily done by flipping the other pancake along with the paper towel over the filling and then peel off the paper towel. Press down the edges to seal. 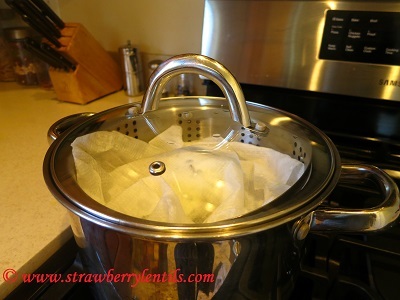 To steam the pathiri, I used my steam basket. You can also do it in your idli/idiappam maker. 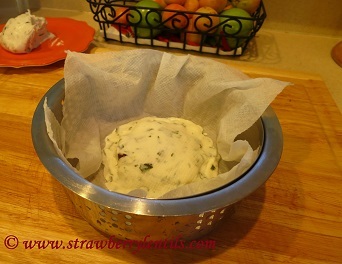 Place the filled pathiri along with its paper towel in the steam basket. 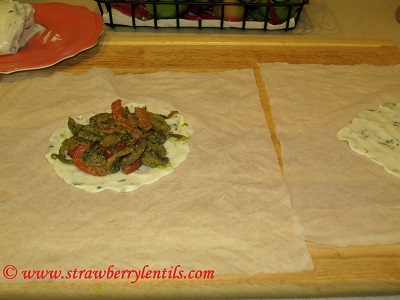 You can also cover the top with another wet paper towel. Steam for 5-7 minutes. This one is done with 4 layers. The procedure is same though, may be a few extra minutes of steaming to ensure the inner pancakes are cooked through.